A few weeks ago, we posed the question as to whether or not Jenn Purviance (43-34-53) was the most subversively gorgeous plus-size model in the industry today. A pair of new test images of the size-18 stunner attest to the fact that, yes, she may very well be. 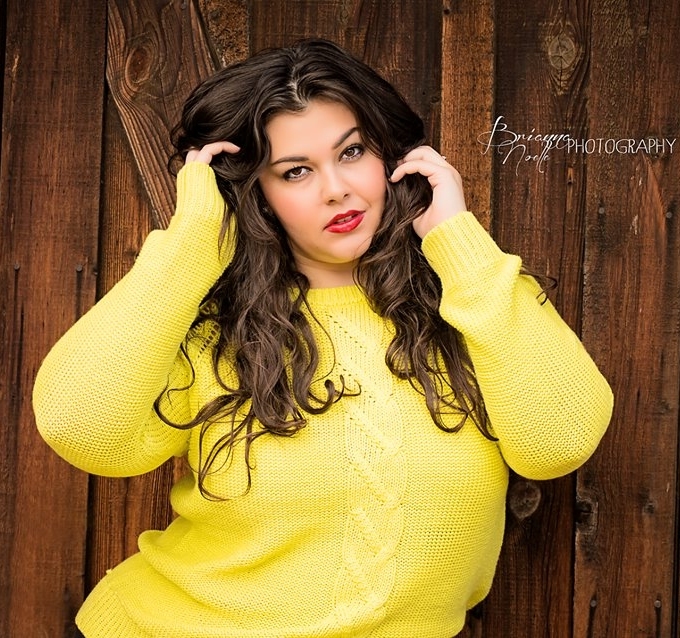 Shot to perfection by Brianna Noelle Photography (www.briannanoellephotography.com), the first of the two pictures shows Jenn looking irresistibly cuddly in a vibrant yellow sweater that lovingly embraces her luscious, well-fed body. 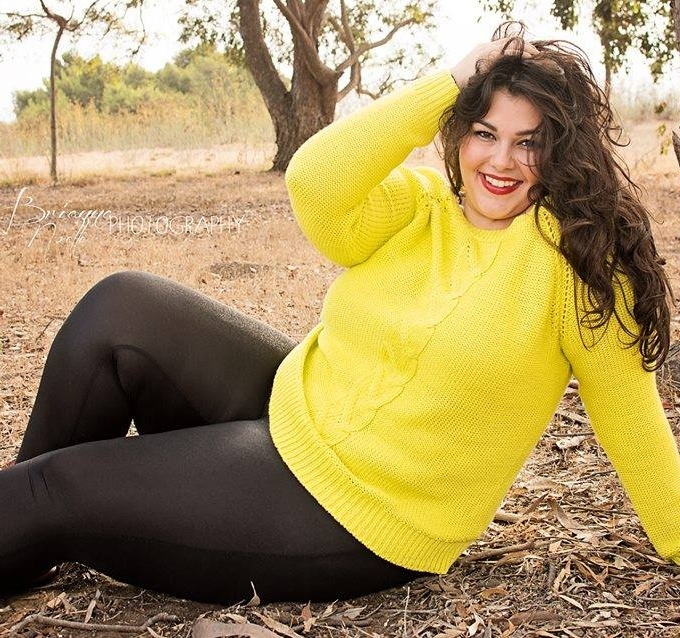 The model's natural contapposto stance accentuates the alluring curve of her womanly 53" hips, even as the sweater discloses her voluptuous richness. All meagre faux-plus models fade to nothingness in the presence of an opulently proportioned goddess such as this. The model's ravishing complexion, with a pretty flush at the cheeks (the robust look that a goddess only acquires as she indulges herself freely), along with the citrus hue of the sweater, accentuate the idea that she is veritably bursting with health and vitality. Not too how much the setting adds to the appeal of the photograph, the outdoor environment complementing the models' fresh beauty and its muted palette providing an idea backdrop for the tangy hue of her outfit. A closer view shows the effortless, natural glamour that Jenn possesses. Observe the overwhelmingly sensual detail of the dimples at the model's knuckles, one of the prettiest of all characteristics that truly curvy beauties possess. But above all, it is the model's pose that makes this photograph such a masterpiece, the bewitching way in which she plunges her hands into her thick, heavy, brunette tresses (just as the viewer would long to do), as if in ecstasy over her own loveliness. A second image of Jenn is no less breathtaking, this one showing the model adopting a darker, more sinfully seductive look. The chocolate colour of her sweater subconsciously suggests the sweet indulgences to which the model must have surrendered to acquire so richly generous a figure. The black nail colour augments the impression of her desirable wickedness, as does the steamy sensuality of her gaze. Further raising the temperature of the photograph is the flirtatious manner in which she pulls down the neck of her sweater to expose a hint of bare flesh, into which she gently presses her fingertips. But most alluring of all is the discreet swell of fullness at the model's waist. The greenery in the background perfectly sets off the colour of the sweater, while allowing the model's fair skin to glow against its darker shadows. Coming in closer highlights the pulse-poundingly sensual detail of the creases of flesh at the model's neck. The photographer deserves limitless acclaim for not airbrushing out gorgeous, feminine details such as this. Also, observe the extraordinary loveliness of Jenn's facial features, which appear as round and full as ripe fruit, exhibiting high cheekbones softened by the sumptuous weight in her face. As a special treat, Jenn also posted a candid from this shoot, and in fact, in this picture her face appears most gorgeous of all, exhibiting that most delectable of facial features, a soft curve under the model's chin, as well as an overall look of richness and youth. Here too the model runs her fingers through her ample, weighty, brunette tresses, while the sweater clings tightly to her buxom curves. Absolutely gorgeous work by Jenn Purviance, as always, whose modelling talents are second to none, and who authentically becomes more beautiful with every new shoot. And kudos to the photographer for her highly effective lighting, composition, and settings, and for avoiding any ugly filtering effects but instead shooting the model in stunning natural light and preserving true colours. This test is a tour de force of plus-size beauty, and fans eagerly hope to see more from the session. 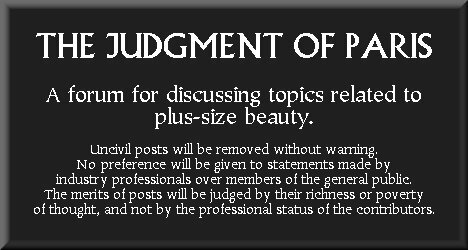 It's always wonderful to see true plus-size beauty showcased here on the Judgment of Paris. Jenn Purviance is genuinely full figured at a size 18, and her lovely curves are rich and opulent. She is dazzling, and a reminder that full figured beauty is also found in the sensuality and mystery of chocolate-brown eyes and lustrous dark hair. Jenn is equally as enchanting as our golden-spun beauties. One further image of the incredibly luscious Jenn Purviance from her shoot with Brianna Noelle Photography has emerged, and if anything, it is even more steamily seductive than the previous two. Jenn curves her well-fed figure into a sinful S-shape, undulating her soft from so languidly that the viewer can almost perceive movement even in this still image. Her chocolate tresses flow lazily over her shoulders in a weighty mass. Excitingly, the model plunges both of her hands into that thick hair, sensually running her fingers through it, gazing at the viewer with a gaze so smouldering that it threatens to ignite the film in the photographer's camera. 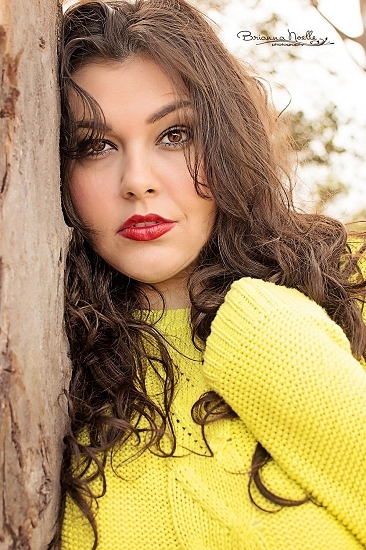 Her body fills her sweater to capacity, even as the bright yellow hue of the material stands out vividly against the warm, dark wooden backdrop, which also sets off her light complexion. A closer view proves the image to be even more alluring than one already perceived. Jenn's features exhibit an intoxicating fullness. The picture exhibits a gorgeous curve under the model's chin, along with seductive, natural creases at her neck--an irresistible testament to the model's fleshiness. Her parted lips impart a suggestion of the models' appetitiveness. Her hair flows every which way, as uncontrollable and enticing as the model's own passions. Jenn Purviance indisputably possesses the most gorgeous physique of any plus-size model working today (rivalled only be Sophie Sheppard). Her every test shoot is a resounding affirmation of the superior beauty of fuller-figured goddesses over their underweight rivals. Fans continue to eagerly look forward to her every new image. 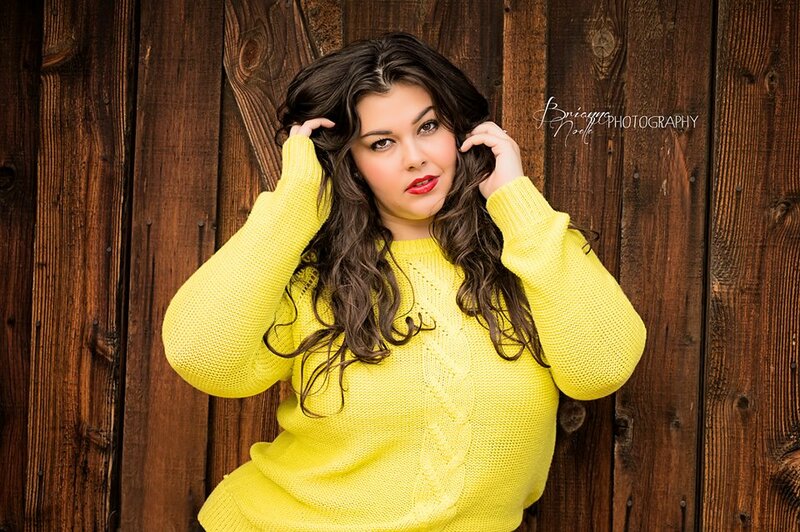 Further confirming her reputation for having the most gorgeous figure of any plus-size model working today, Jenn Purviance recently released another image from her extraordinary shoot with Brianna Noelle Photography, and in it, incredibly, she manages to look more luscious and desirable than ever before. Has there ever before been a photograph that communicates so vividly the joy and beauty of feminine self-indulgence? Even Jenn's facial features appear lovelier than ever, with a richer fullness in her visage which makes her appear younger--as youthful as a junior plus-size model--and utterly adorable. Her eyes glint with self-satisfaction, while the way in which she plunges her hand into her thick, heavy tresses suggests uninhibited vanity, an almost ecstatic pleasure in her own beauty. Those tresses are wild and untamed, conveying a sense of freedom and abandon, as does Jenn's opulent appearance. And of course, her figure is nothing short of a miracle. The yellow sweater suggests the lavish contours of the well-fed body beneath, hinting at her tantalizing curves. But most seductive of all, her fitted tights lovingly define the ample fullness of her luscious thighs, so sumptuously abundant, so generously proportioned, irresistibly alluring. One cannot imagine how any other image, short of a sleeveless shot, could ever display timeless feminine beauty as gloriously as this. Between her lush physique, her doll-like facial features, and above all, her intoxicating self-adoration, Jenn is the perfect plus-size model, as much the ideal brunette as Sophie Sheppard is the ideal blonde, and one cannot imagine any goddess ever rivalling Jenn's appearance in this image for the title of "most perfectly proportioned full-figured model in the world." We eagerly look forward to more campaigns from this supremely curvaceous talent. Also of note is a new video that has appeared on YouTube, via the Curvy Bridal Show channel. We have no idea to what "show" the channel's title might pertain, but it features footage of Jenn looking absolutely mesmerizing as she discusses her forthcoming nuptials. Her stunning hair cascades around her face in romantic waves, while her gorgeous visage exhibits that most sensual of all facial features, a curve under the chin. I'm a plus-size woman, but I'm confident. I want to show off my curves. I don't want to hide them or tuck them behind a big dress that's not going to show them off. Those words follow Jenn's enthusiastic observation about the rich proportions of her hips. I don't want everyone else to look at me and think that my dress is mediocre. 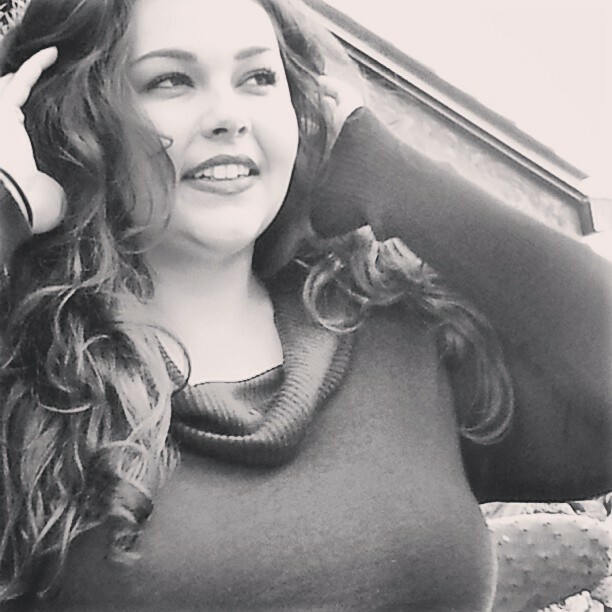 I'm a model. I've got to have the best dress to make this look just as good as modelling jobs that I've done, if not better . . . I just want it to be the hottest, best-fitting dress. Jenn clearly recognizes that she is celebrated as a paragon of lovelienss and that, being such, she deserves to be apparelled in the finest of garments. This is the justified vanity of a true goddess: the idea that she deserves the best, that her beauty positively requires her to present herself in the most captivating manner possible. 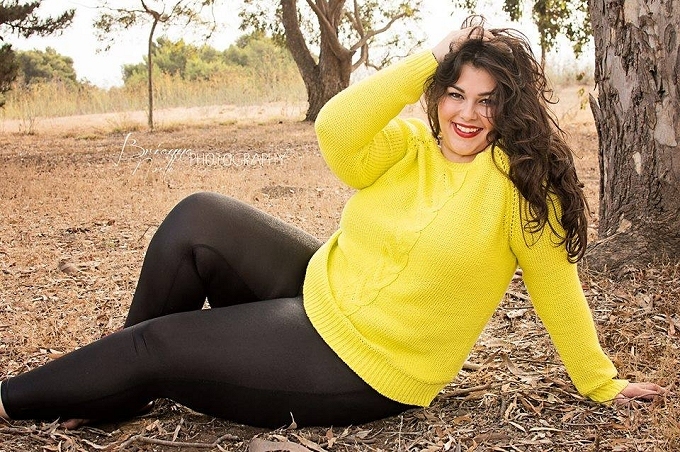 All plus-size models should see themselves this way, so that they can then impart this sense of their own aesthetic preeminence to other full-figured girls.